We were invited to present our work at teacher training in CNC technology. The teachers present at this workshop were form schools from the field of mechanical engineering. The field of mechanical engineering is very fast changing and we think that this field would be most appropriate to be introduced to e-learning. The feedback was very positive and their opinion was that this e-course would be special suitable for young teacher who are good with technology but not that good in pedagogy of using it in e-learning. We were honored to be able to present our work to the leaders of study groups for teachers from the field of mechanical engineering. They will be the ambassadors for spreading the word about the project and its results among mechanical engineering schools in Slovenia. We wanted to give them very good and broad information about the project and special about e-course and facilitators handbook. We have manage to get another meeting that will be on October the 14th with the aim to invite more teachers to participate in this e-course that will be implemented through the program of further education and training for teachers. 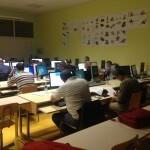 This program is organized by Ministry for education of Slovenia. Recording professional development through evidence of competences and qualification online. 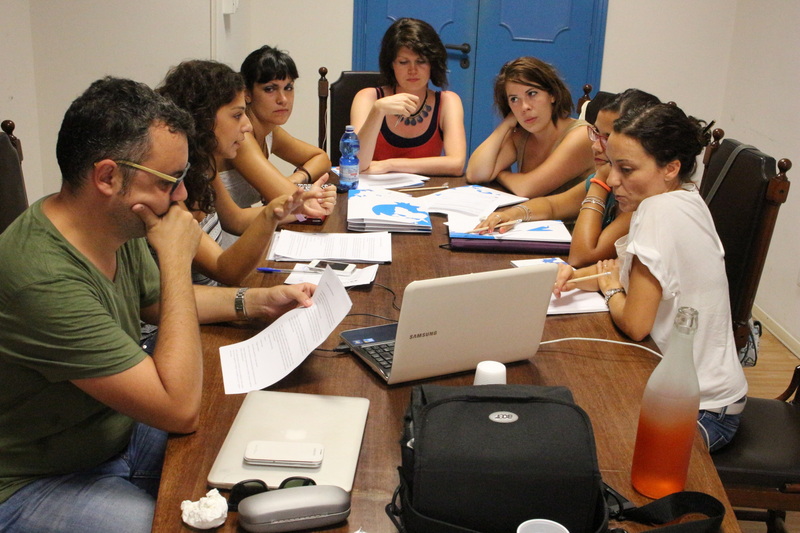 In September 2014, three eVET2EDU workshops were held in Italy. Two workshops took place in the Technical Institute for Transport and Logistics “Gioeni Trabia” of Palermo, where were involved about a hundred teachers and professors of the same institute. The Institute would like to include the eVET2EDU e-course into its Moodle Platform and the Director showed the interest to integrate the course as a refresher course for his teachers. The third one was held at CESIE office with a smaller number of teachers and trainers from different schools and VET Institutions. 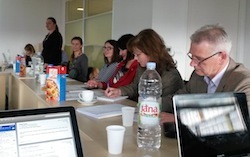 The workshop focused on the practical and concrete aspects of e-course. The main project results – the online course and the facilitator’s handbook – were finally released as Open Educational Resources. 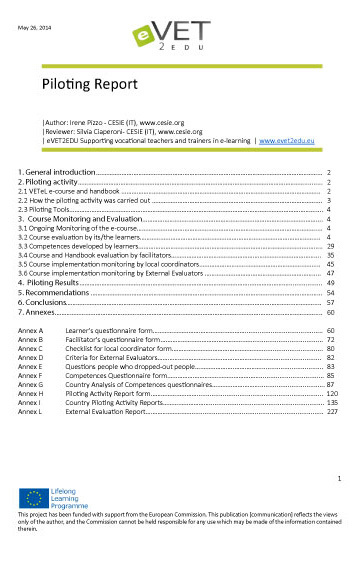 After 3 months of piloting phrase, the course and the handbook were revised and made available online under Creative Commons Attribution 3.0 Unported license so that the resources can be re-used, copied and modified according to the needs. Both resources are downloadable from evet2edu repository in 9 languages: English, Polish, Czech, Croatian, Slovenian, Lithuanian, Spanish, Italian and Norwegian. The original course was also open on Moodle platform where all localised versions are accessible as OER and can be browsed with no registration/login. For more details, visit evet2edu repository. On May 30th CARNet team held the first exploitation workshop at the Agency for Vocational Education and Training and Adult Education, the institution in charge of the inservice training of vocational teachers. The workshop was attended by the representatives of the Agency, advisors for specific vocational areas. 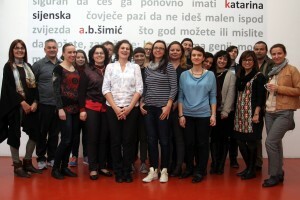 In order to ensure the best possible project results, we asked our participants and course tutors during the piloting of the VETeL course in all the partner countries to provide us with regular feedback on individual modules, the design of activities and interaction, the time allocated for those activities, the quality of content, the usefulness and quality of moderation. Additionally, the course was evaluated by an external expert evaluator, who assessed the course design and provided the team with additional guidelines for improvements and revision. We are presenting Piloting Report based on the feedbacks received from all actors involved during the piloting phase of the e-course VETel . 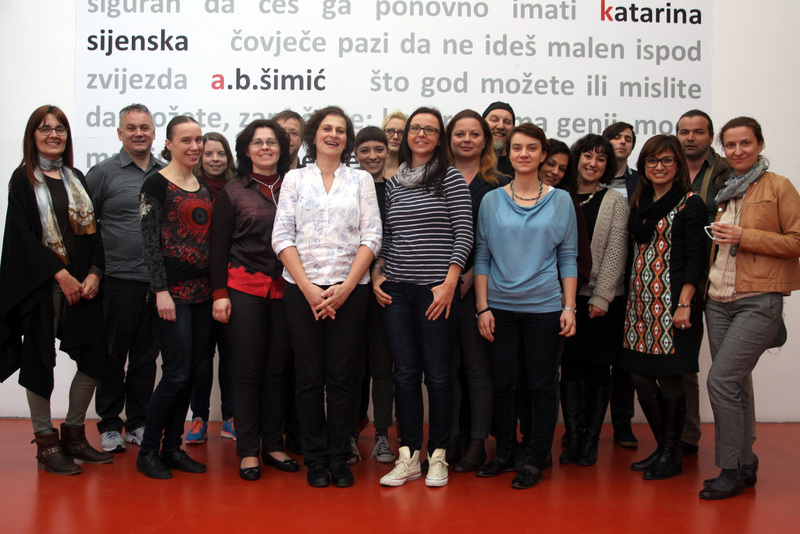 On Thursday and Friday (27th and 28th of March 2014) we had our fourth partners’ meeting. It was held in a very beautiful Croatian cost city of Split. The meeting was very fruitful and we have accomplished a lot. An action plan for WP 3 has been prepared, as well as a course and handbook amendments. They are intended for exploitation, sustainability and for dissemination activities that will follow in next months. There is still a lot of work ahead of us, but the finished products will be very useful for all VET teachers and we are eager to keep up the good work.